From April 1st to September 2012, 398 British Cycling members were involved in road incidents, with 23 per cent occurring at junctions and 13 per cent at roundabouts. The figures were gleaned from British Cycling’s 63,000 members, meaning less than one per cent were involved in incidents. Of the 398 incidents, 142 (36 per cent) were at junctions or roundabouts. The second most common cause of an incident involving cyclists was a motor vehicle driver making an incorrect or dangerous manoeuvre on the road. Twenty per cent occurred in this way, including failing to look before turning into a road or failing to check a blind spot before pulling out. 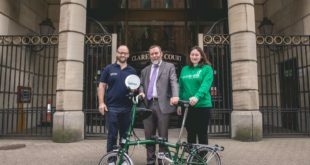 16 per cent of incidents were caused by cyclist error or negligence, 12 per cent by a defective strip of road, spillage or obstruction in the cyclist’s path. As the maker’s of the recent "War on the Roads" documentary might be surprised to note, only six incidents (1.5 per cent) involved road rage. British Cycling legal affairs director Martin Gibbs said: "The figures behind our members’ incidents paint a pretty clear picture. In order to improve conditions for cyclists on the road, greater investment needs to go into junction design and infrastructure. We need the government to put cycling at the heart of its transport policy – with a commitment to turn this country into a cycling nation to rival great countries like Holland and Denmark. Chris Boardman MBE poured cold water on the ‘war on the roads’ theory: “It’s important that we put these figures into perspective. Of British Cycling’s 63,000 members, only 398 – that’s much less than even one per cent – have reported incidents to us in the past six months. Last night James Cracknell presented a cycling safety special on Radio 5. More on that here.